Greek Default Watch: What Are Greeks Fed Up With? Greeks are gathering to tell their government that they are “fed up.” With no coherent message, however, we are left to guess as to what exactly they are fed up with. A recent public opinion poll by Public Issue gives us a glimpse into that question. 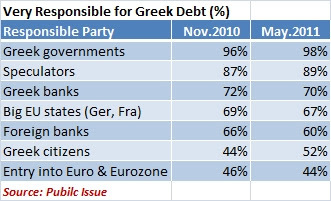 Most relevant among the questions was this: how responsible do you hold the following parties for Greece’s debt. The answers ranged from “very” to “little.” What they highlight is that this country still needs a narrative about how it got into this mess; and it also needs its citizenry to own up to its share of the blame. On top of the list, with near universal (98%) disapproval, are “Greek governments.” The plural form is important: this is not the fault of the current government alone. But how far back does one go? Do people think that it is mostly the fault of the previous government, which admittedly derailed the country’s finances beyond the sorry state they were in to begin with? Or does one condemn the wider political and economic model that Greece has practiced since the restoration of democracy in 1974? Or does one go further back, to the civil war and its polarizing aftermath or even back to the formation of the Greek state? A poll will not capture such idiosyncrasies; but the near-universality of the answer may contain less consensus that is suggested at first. Next come speculators (89%). This is a bizarre place to put blame, although PM Papandreou often does so. My response to this is, “don’t blame the messenger.” Speculators are of course rushing to profit from Greece’s woes. And their bets against Greece are making it harder for the country to borrow. But speculators did not create Greece’s debt. When they bet against Greece, they are merely a mirror showing us our imperfections. When they distrust the government’s reform agenda, they merely point out the obvious: that Greece’s chances to avoid default are slim and depend on a program that the government is less and less unified in its willingness to implement. Don’t blame the messenger. Then come Greek banks (70%). This is equally odd. Greek banks certainly acted in a predatory manner – their failure of their loan portfolios demonstrates quite quickly how little due diligence they performed. My own experience tells me of banks pushing out loans to meet targets without brothering to find out if the recipients needed the loans or if they could repay them. And besides tax collectors, banks calling in loans are the chief economic manifestation of the crisis for the average Greek citizen and company. But insofar as Greece’s chief problem is public rather than private debt, banks are not really to blame – they may have bought Greek debt, and in that sense, they failed in their public due diligence as much as they failed in their private due diligence. But again, they did not create Greece’s debt problem. Next on the list are Big EU states such as Germany and France (67%). I am puzzled by this. Is there some blame on German governments and German companies for engaging in corruption with Greece’s political system? Could such practices have added to Greece’s debt? Perhaps. Are they also to blame for tearing apart the Stability and Growth Pact (SGP)? Indeed. But to hold them largely responsible for Greek debt misreads economic history: they aided and abetted the crime in indirect ways and could have helped prevent it if they put enormous (and unrealistic for the time) pressure on Greece. But again their culpability is a few steps removed. Next come foreign banks. Foreign banks behaved similarly irresponsibly in their due diligence of buying Greek debt as Greek banks did. Perhaps the 10 percentage points difference between their disapproval rating and that of Greek banks illustrates the lack of immediate contact that Greeks have with those banks. Or it may show that whatever foreign banks Greeks hold responsible, they do so under the umbrella of a “speculator.” Either way, their responsibility is not very high. Next on the list are Greek citizens, but I want to spend more time on that answer so let me skip ahead to the final answer for a second: the euro. The level of blame that Greeks put on the euro (44%) tells us, first and foremost, just how badly the fear a return to the drachma. If the Euro is to blame, then getting out of it could be part of the solution, but most Greeks are hesitant to reach that conclusion. How about blaming the euro for Greece’s debt? 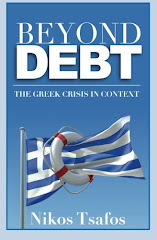 In part the euro helped Greek debt remained low – the effort to enter into the Eurozone was a chief driver behind the stabilization of debt in the 1990s (see here). After that, however, the euro was a debt-enabler, allowing Greece to borrow at interest rates that were increasingly closer to Germany’s. The euro was the excuse that Greek and foreign banks used to avoid doing due diligence. This brings us to the last culprit: the Greek people. Two obvious observations stand out here are: the big change in the perception of culpability between November 2010 and May 2011: 8% more blame the Greek people than did in November 2010. The second observation is the disconnect of the blame that Greeks put on their governments versus themselves: 98% vs. 52%. How can such disconnect be explained? Greece is no Egypt under Hosni Mubarak. The governments that Greeks so wholeheartedly blame were voted in repeatedly over the years rather than imposed from abroad or by force. The web that links private choice with public outcomes is obviously complex, and the ability of one person or group to affect the country’s wide political trajectory can be limited. But the wider renunciation of their governments demonstrates an abdication of responsibility: everyone is to blame but me, although the increase in the share of people willing to take a broader view is heartening. It also helps us understand a bit more that 98% of “government blame.” It seems to be more narrowly based on the perception of corrupt politicians rather than a corrupt system of patronage. As I dissect this poll, a natural question pops up: where would I put the blame? My culprits are Greek governments and the Greek people, although one institution I would also blame (not on the list) is the press, which has been, as a whole, inadequate in investigative journalism to expose corruption and keep the body politic honest. I would blame Greek governments because, besides the Simitis government that got Greece into the Eurozone, their sole preoccupation was (a) how to profit personally at the public’s expense and (b) how to dole out state patronage to get reelected. Never did they offer a bigger vision for the country, nor where they able to lead the country towards any goal. They prolonged a system rather than try to change anything. The current crisis is an unequivocal condemnation of the statist system created by Andreas Papandreou in the 1980s and perpetuated by his successors. It is that system that needs change. But I would blame equally the Greek people, not just for voting these buffoons into office, but for demanding favors as a way of life. In the 1980s, statism was “supply driven” in the sense that the A. Papandreou government brought its supporters into the state sector to gain their electoral support. As time passed, however, patronage became demand driven – people came to expect these favors, they visited their representatives to ask for them, and they made their vote conditional on getting them. Besides merely corrupting the electoral process and bloating the public sector, this process also lowered the expectations of a large portion of the Greek people. It is a sad country when a young kid dreams of becoming a public sector employee that goes home at 2 pm and never works. Yet that is what Greece became. Greeks share blame for accepting that reality - and for not demanding more from our politicians and from ourselves.